Lincoln Chafee is running for President of the United States of America next year. If you thought Jim Webb and Martin O’Malley were polling poorly for the Democratic party nomination, Chafee takes it to a whole new level. Many polls have him on 0%, albeit with a low sample of voters. So why is he lagging so far behind the others? With under $30,000 raised by Chafee, this pales in comparison to Ben Carson, a Republican outsider for the nomination, who has raised in excess of $10,000,000. 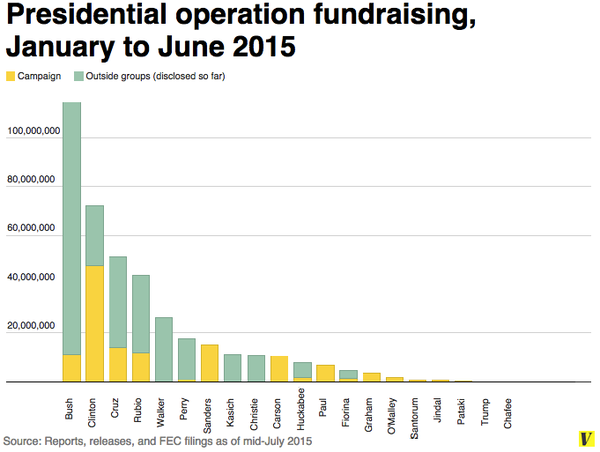 And then leading the pack of all candidates is Jeb Bush, who has almost raked in $115 million so far. There’s nothing to see for Chafee, quite literally. (On a side note, it’s interesting to note how most Republican candidates receive most of their money from ‘outside groups’, with candidates like Scott Walker, Chris Christie and John Kasich getting all their money from these groups. Conversely, Democratic fundraising is more campaign driven, suggesting a stronger grassroots movement and less corporate donors). The most coverage Chafee has received when it comes to his stance on…well anything, was his suggestion that the US should use the metric system. I think that says a lot about how reserved he has been thus far. A quick click on his website provides brief explanations for what he stands for, but beyond that he has not been vocal enough on these things to warrant any kind of media coverage. His Facebook page does not even have 10,000 likes. If, say there was an impassioned speech of him criticising the shortcomings of the Iraq war, I’d feel a lot more compelled to support him than if he simply points out he voted against it. Charisma is a must for a candidate and I’m not feeling it. Lincoln Chafee will be at 8 events over the next 5 weeks. That doesn’t seem too bad, but when you have someone like Hillary Clinton vying for the Democratic nominations, suddenly one must put this all into perspective. She attended donor 26 events in person last month, and has a countless number of events set up by her own supporters. Compared to Clinton and Sanders, Chafee is nowhere to be found. His reach nationwide is minimal. I should just point out that this is not a criticism of Lincoln Chafee himself; rather I’m just highlighting that sadly his campaign has been nothing short of bad so far and that he’ll need to do a lot to get it back on track. On a personal level he’s actually a candidate I think deserves more attention. How much can Chafee do to raise more money? Do you think it’s a good thing that so much money is poured into supporting these candidates? If not, what’s the alternative? Next Post The resurgence of Socialism: Valuable or Vile? Bernie Sanders I understand. Martin O’Malley I understand. Jim Webb I understand. But Lincoln Chafee. Maybe he’s running for Vice President.